Everything Audio Network: Home Recording Studio Review!Mojave MA-301FET Multi-PatternLarge Condenser Microphone:"The Mic I Wished I’d Designed!" "The Mic I Wished I’d Designed!" As a classical music recording engineer and producer, I've been using (and collecting) expensive microphones for over forty-five years. One might say that I've made a career out of it, since — in classical music recording — very little audio processing is ever done to the microphone's signal. Thus, the sound of the microphones themselves (and their placement in the hall) completely determines the sound of the finished recording. During all those years, I've seen various styles and fashions of classical music recording come and go, and I've adapted accordingly, evolving from a completely purist two-microphone approach, to a more eclectic style, using subsets of my microphone collection as paints — just like an visual artist would — to create, on my audio canvas, my best illusion of the performing musicians playing in the space between and around the listener's home loudspeaker setup. To further that end result, I call upon both small and large diaphragm microphones, of both condenser and ribbon design, in various synergistic and euphonic combinations, but the quality that most of them share is that very few of them are actually off-the-shelf "store-bought" microphones. They may have started off that way, long ago, but over the years I've had the privilege of working with a few, very talented microphone designers and tweakers who have modified my wonderful Neumann, Schoeps, and AKG vacuum tube condenser mics (originally manufactured back in the fifties and sixties) with upgrades to their capsules and electronics — all in the name of increasing their resolution while maintaining their individual personalities. Make no mistake about it, even the flattest response, most "accurate" microphone has an audible personality and, as I just wrote, in classical music recording, the microphone's personality impacts directly on the perceived sound of that recording. Over the decades of watching and listening to my precious mics being modified and tweaked has taught me quite a bit about the trade-offs involved in microphone design, and I've often wondered what kind of microphone I'd design for myself if I were going to start from scratch. I've learned to appreciate, from direct experience, the difference in sound between a 6-micron, a 3-micron, a 1.5 micron, and even thinner Mylar capsule diaphragms, such as those made from 1.0 and 0.9 micron film. But would it be a vacuum tube mic, or one using a solid-state FET impedance converter (since the Field Effect Transistor most closely models the parameters of tubes, and can be used in circuits which mimic the simplicity of early tube mic circuits)? Since I use both large and small diaphragm mics in my own recordings, I'd have to design one of each kind. Luckily for me, I no longer have to theorize and dream about designing my own special mic: Mojave Audio actually manufactures a model that is about as close to my ideal as possible, the Mojave MA-301fet. It was designed by David Royer, an innovative microphone designer who started working in the mid-eighties, at the same time as a few other independent mic engineers, who also surfaced simultaneously in California. Today, Royer is now a major force in high-quality microphone manufacturing: running his namesake ribbon-microphone company, Royer Labs and a second company, Mojave Audio, which produces lower cost, yet high-performance condenser microphones. The Mojaves immediately improved upon the sound I had become accustomed to from those aforementioned tweaked Neumann M 249s. Mojave Audio has its roots in Dave Royer’s garage, circa 1985, where he first started repairing and modifying American and Japanese condenser mics, working his way up the learning curve in the nineties to the expensive European mics owned by L.A.-area engineers. And while designer Stephen Paul, who died in 2003, was the original pioneer of aftermarket capsule rebuilding and ultra low-mass diaphragms, Dave Royer went on to actually manufacture an entire line of condenser microphones based on the principles honed by that tiny group of California microphone designers. The results of that fertile California mic design atmosphere are now available for all of us to experience in the current Mojave Audio microphone line, which now includes two small diaphragm condenser models (tube and FET) and four large diaphragm condenser (two tube and two FET, whose models are distinguished by their assortment of polar patterns). Mojave's latest mic model, the MA-301fet, is a three-pattern, solid-state LDC (large diaphragm condenser) shaped roughly like a black Neumann U87. I think the MA-301fet is the most "universal" of all the Mojave mics, and I really like it. 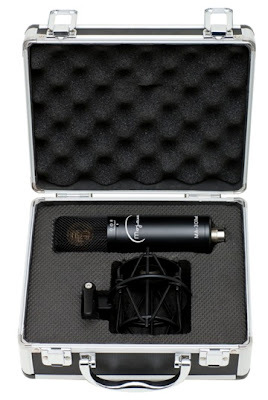 As with all Mojave mics, the MA-301fet is designed in the USA, but built at Royer’s mic facility in China — using a mix of US and Chinese components. The quality of the best Chinese-built mics now rivals European and USA models, and the MA-301fet typifies that quality with solid construction and fit/finish. The mic’s -15 dB pad and bass roll-off switches are precise, and high-grade internal parts — Jensen transformer and military grade FET — show that this mic has a high-end pedigree. Factory rated specs, including 14 dB self-noise and 120 dB maximum SPL, show that it can work in any studio application. The bass roll-off affects bass at 6dB per octave under 100 Hz. The mic comes with a nice carrying case and shock mount. The $899 price is an incredible bargain for this kind of quality. In his design of the MA-201fet and MA-301fet microphones, David Royer has designed a FET version of the classic vacuum tube impedance converter circuit, which is exactly the kind of design I would make. The classic tube circuit, as found in many of my classic mics, such as my Neumann M 49s, M 50s, and KM 53s and ‘54s, AKG C 60s, and my Schoeps 221Bs, is based on a simple, sub-miniature triode tube (the Telefunken AC-701k); the number of passive parts accompanying that tube design can be counted on the fingers of one hand; the circuit is really that simple! As a longtime recording engineer, I am convinced that the new, fashionably black Mojave MA-301fet is the new U87 for the twenty-first century. In the Mojave FET mic design, Royer has succeeded in modeling that classic tube circuit with a FET instead of a tube, yet he still kept the passive parts count low, with a minimal complement of high-quality resistors, capacitors and, of course, that large audiophile-quality Jensen transformer. The design is amazingly close to the mic concept milling around in my head. It is like David Royer was reading my mind. The capsule design is just as impressive. As a result of several decades of empirical field evidence from thin-film, high-resolution capsule diaphragms, Royer chose 3 microns as the best compromise diaphragm film for all his microphones, and I agree with his decision, especially for a product to be made in quantity. Any thinner than 3 microns and you start to reach diminishing returns with the resolution, while simultaneously making manufacturing consistency increasingly difficult. **David Royer modeled the Mojave capsule on the Neuman KK67 design (U 67) rather than the M7/KK47 capsule, used in the U 47 and M 49, because of its better off-axis performance. The Mojave capsule’s sonic performance is excellent. In fact, it sounds closer to my prized, Stephen Paul-modified 1.5 micron Neumann M 269 than my 3-micron capsule M 249 vintage Neumann. I do not make this statement loosely; I'm intimately familiar with the sound of those classic mics (and the improvements brought by the modifications I had done back in the late eighties), so I calls it like I hears it! So what does the MA-301fet sound like in the real world? In two words, big and clear. Used as a spaced pair of cardioids on my Mason and Hamlin piano, the Mojaves immediately improved upon the sound I had become accustomed to from those aforementioned tweaked Neumann M 249s — a pair probably worth at least five times the asking price of two MA-301fets. No, they didn't have the last bit of vacuum tube "liquidity" I get from my Neumanns, but they sounded at least as large, and were definitely clearer. I'll assume that the tube version of the MA-301fet, the MA-300, would have given me that little bit of liquidity, but hearing the huge sound I heard from this solid-state mic was quite an eye-opener! A few days later, I had a session where I had to mike a classical violin duo, while recording contemporary classical music. I tried the MA-301fets on the two violinists. If I placed the Mojaves low and slightly farther away than one would normally think of for a spot mic, the MA-301fets produced a big and completely believable sound on each of the violins. I consider this an acid test for any mic; if it can successfully capture a classical violin soloist close-up, then it can capture any difficult source. I also compared the MA-301fet pair with my Gefell M-930s, a cardioid-only mic which uses an authentic M7 diaphragm, accompanied by modern solid-state electronics. There was no contest; the MA-301fets were clearer and larger-sounding. Here, their 3-micron diaphragms, coupled with the KK67 backplates, proved that the thicker diaphragms and older design of the original M7 capsule could not compete. Noise-wise, the Gefells were a little bit quieter, but the design of their electronics trades off extremely low self-noise for a thicker, more "tense" sound quality. For voice, the MA-301fet is predictable because of its flat frequency response curve. For smooth voices, which mate well with accurate, crisp mics, they sounded wonderful. For voices on the shrill, or sibilant side, it sounded a little too "hi-fi" and accurate, whereas a mellow ribbon mic or my old U 47 would have colored the voice pickup euphonically. Luckily for me, I no longer have to theorize and dream about designing my own special mic: Mojave Audio actually manufactures a model that is about as close to my ideal as possible. The MA-301fets also sounded killer on acoustic guitar, making even a cheaper instrument sound a bit more like a big Martin. A pair of these on a really good acoustic guitar, steel string or classical, would be just the ticket for an audiophile-quality, solo guitar recording session. I tried the pair in both omnidirectional and cardioid patterns, and each one provide results superior to my already high expectations. When I was starting out in the recording business back in the early seventies, the Neumann U 87 was quickly becoming the standard studio mic (replacing the cumbersome, "old-fashioned" vacuum tube U 67) because, like its predecessor, it was designed to sound good on everything — from individual instruments to the human voice. Over the years, microphone fashions have changed, and many engineers (yours truly, included) now appreciate the special virtues of classic vacuum tube large diaphragm condensers, even with their bulky power supplies. Nevertheless, the need for a "studio standard," solid-state large diaphragm mic — that sounds great on everything and always works with no fuss — remains the same. As a longtime recording engineer, I am convinced that the new, fashionably black Mojave MA-301fet is the new U 87 for the twenty-first century. Dave Royer has, thus, come full circle, from tweaking and repairing old ‘87s to founding a company which now manufactures its modern replacement. Based on my experience, an off-the-shelf, store-bought Mojave MA-301fet, street priced at $900, surpasses a stock U 87 in its sonic flexibility and accuracy. It even compares favorably with my seriously-tweaked, vintage Neumanns that are worth many times its price! Congratulations, David Royer. You have built the mic that I had designed in my head — and it sounds as wonderful as I had imagined. The Everything Audio Network Stellar Sound Award has never been more deserved. Great review, thanks very much! I just did a shoot out test between this, the AKG C214, Audio Technica 4033A and the Royer R101. Going through an SSL 4000 pre the results were mixed, the 214 had much more body but lacked the sparkle and class in the top end. Mojave was a bit to shrill on some sources. The Ribbon 101 was very dark sounding but really nice on some special sources. But put them through my UA610 pre and the Mojhave wins hands down. Really classy sound with loads of detail in the dynamics of a performance. Acoustic guitar sounds really special! Sold!